Surrey’s mayor has rejected a $2-billion SkyTrain expansion and called again on TransLink to create a light rail system south of the Fraser river. In her annual State of the City address Tuesday, Watts told a packed room of business representatives the proposed regional transit options are either too expensive or too polluting. Watts said Light Rail Transit will help connect the neighbourhoods of the province’s fastest-growing city. The proposed LRT would run along three key corridors — 104Avenue, Fraser Highway to Langley and King George Boulevard — and cost less than a SkyTrain extension. 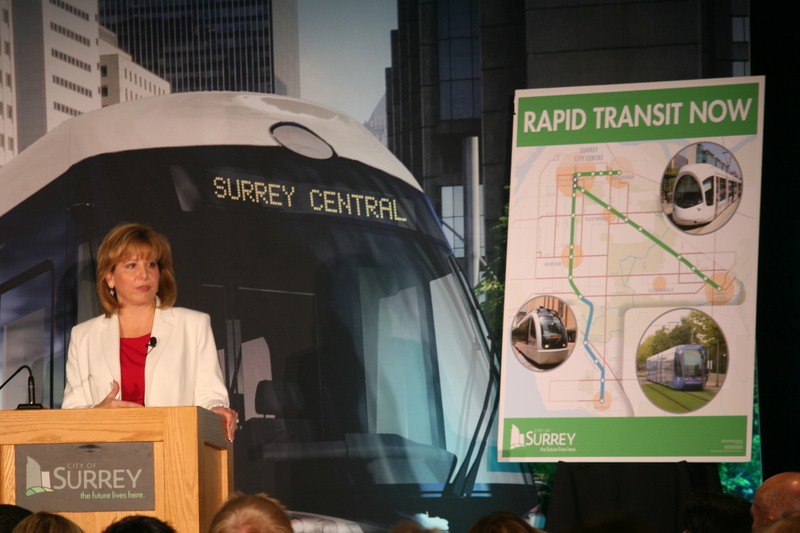 TransLink is in the drafting stages of an LRT option for Surrey and Watts said she hopes to receive public input on the proposal. To contribute to the LRT discussion, go to http://www.surrey.ca/RapidTransitNow. Watts also called for a more equitable tolling system, claiming bridge tolls should be at most 75 cents to a dollar and that the province should collect revenue by tolling other expensive regional projects. “The Sea-to-Sky highway — significant money went into the upgrades of that — that’s not tolled. There’s people around the region, including myself, that think it should have been,” she said. Watts said she hopes the newly-established office of the Auditor General for Local Government will examine the downloading of costs from other levels of government onto cities, which currently receive eight cents for every tax dollar collected in Canada. Surrey has been aggressively expanding under its Build Surrey program to meet its population growth, which is estimated to be 750,000 by 2040.